In April 2016, the company Sibilare did a study on the state of Spanish banks’ digital reputation, using Websays data. In this report, tweets were analyzed to study the opinions banks evoked, as were their evolution over time. A graphic like that above allows us to analyze within a matter of seconds the “sympathy” a bank generates as compared to its competitors. 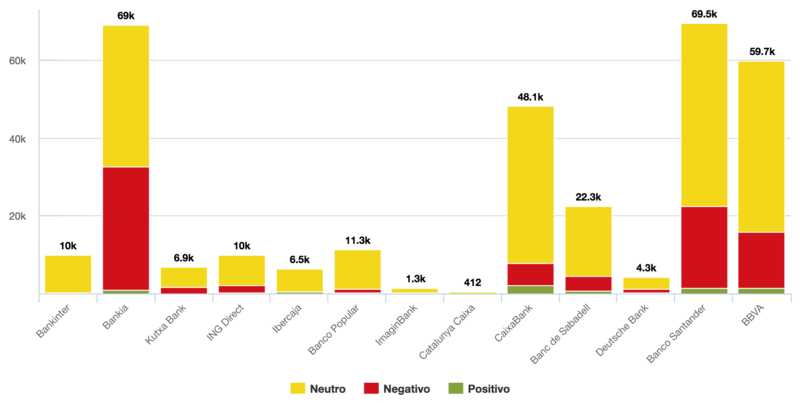 That way, at a glance, it’s easy to see that Bankia was the bank that received the highest number of negative comments and that CaixaBank was the one that received the most positive ones. It’s also important to know how many people we are reaching. That is calculated by “reach,” the potential reach of what you are publishing, taking into account not only our followers but also the followers of those who retweet us. 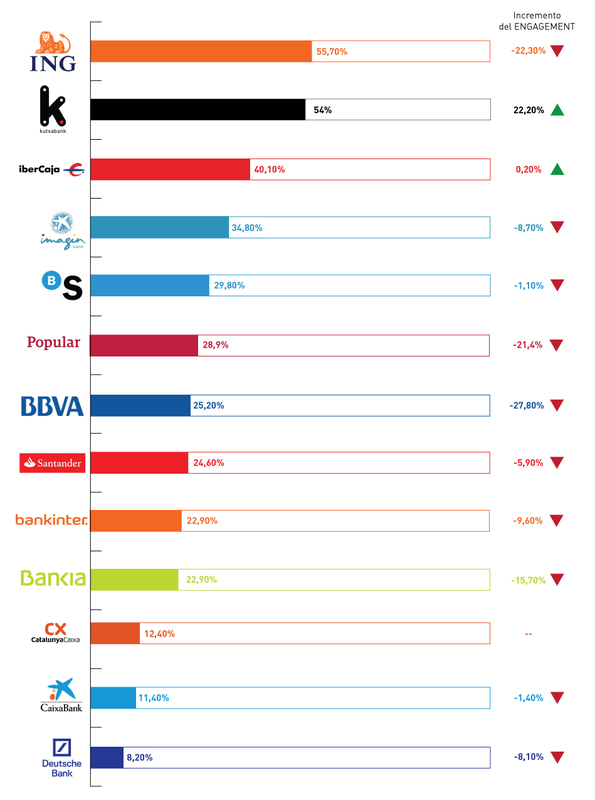 As we can see in this graph, taken from the “comparison” tool that Websays offers, BBVA is the bank with the widest reach, followed by Banco Santander and Bankia. 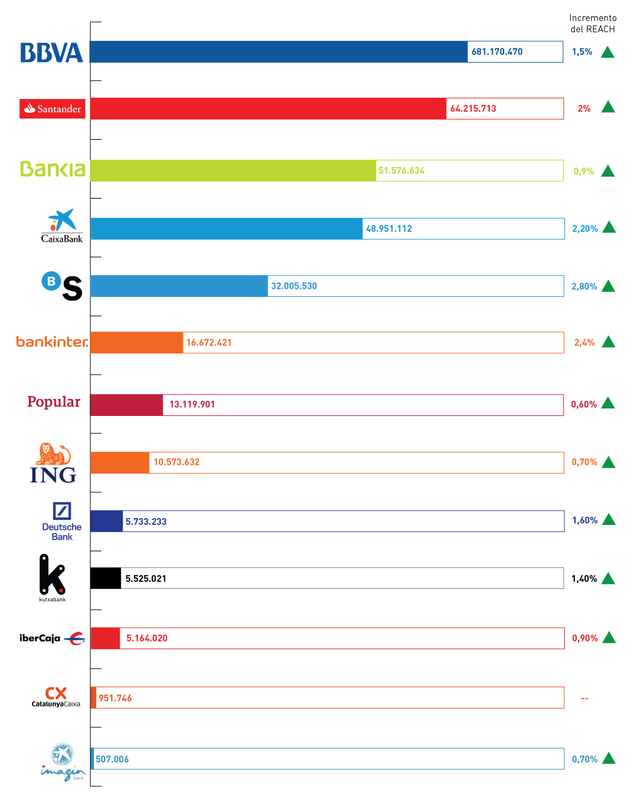 This means that the tweets published by the Caixa reached only 7% of the users that BBVA’s did. A bank’s communication strategy – just like any company’s – is crucially important to its results. You have to be sure that the clients are getting the messages, for which a good control of reach is important, especially with respect to competitors. This indicator can be complimented by the engagement measure, that is to say, the level of loyalty among your audience that is calculated with mentions in corporate channels (those in which the users mention one of the official channels) with respect to the total number of mentions. In ING’s case, as well as in KutxaBank’s, we can see that more than 50% of the mentions occurred over the brand channels. Why is this measure of interest? On the one hand, it helps us control the conversation. A low level of engagement reveals that the better part of the conversation is taking place outside of our channels, and we should therefore manage to attend to these mentions and redirect them to corporate channels. Additionally, it reveals the trust and proximity a bank has with its clients. A client that directs its questions directly to the bank’s official cannel is more loyal than one that tweets externally.